Hortus Camdenensis | Cupressus goveniana Gord. Fully hardy conical shrub or tree with loosely arranged, ascending branches, long, drooping branchlets, and globular cones to 2cm long. To 22m. There are a number of garden varieties, such as pygmaea and aurea. [RHSE, Hortus, Hilliers']. Introduced to Britain in 1848. [JD]. 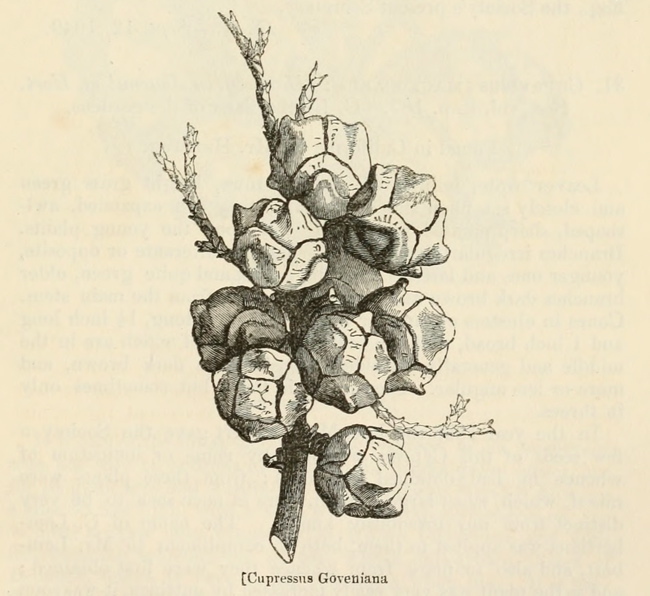 ‘This fine Cypress was first discovered by Mr. Hartweg, on the western declivity of the mountains of Monterey in Upper California, within two miles of the sea shore, in company with Pinus muricata, forming a dense bush from 6 to 10 feet in height. 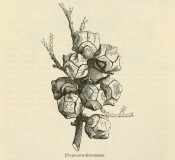 It is at once distinguished from the other Californian species by its very much smaller cones and more spreading, slender, somewhat pendulous branches. It has the same beautiful bright green colour, both in its foliage and branches, as Cupressus macrocarpa, and is a most desirable evergreen, which will prove quite hardy. It has been named in compliment to James Robert Gowen, Esq., the Society's present Secretary.’ [JHS iv 295/1849]. Listed only in a hand-written entry in an 1850 catalogue held at the Mitchell Library and inscribed on the front Wm. Macarthur 23rd Dec. 1854 [ML 635.9m], but certainly present in the gardens at this time. Cupressus goveniana Eng. = Cupressus sargentii Jeps., similar to, and considered by some to be a form of, Cupressus goveniana Gord.